So, chickpeas are pretty awesome. I’ve been enjoying them atop salads, in soups and cooked with spinach for some time. And every time I use them for something else, I think to myself, “I really need to try these roasted.” Well, I did. And they’re great. I love this salty-spicy blend of flavors, the crunchy, hearty chickpeas and the earthy rosemary that rounds it out. I ate half of these hot from the oven and the other half tossed over a salad later in the day. Yum. recipe notes: I’ve read a number of recipes and all of them mention that the chickpeas need to be very dry before you start the roasting. This will ensure the crispy exterior. I used a can of chickpeas (as opposed to home-made), rinsed them in a salad spinner, rolled them around in a kitchen towel to dry them, then left them sit out awhile. Probably half of them were super crispy on the outside and the other half were not as crispy. Next time, I’ll probably let them dry out a little more. The ones I didn’t eat right away I stored in an air-tight container. They definitely lost their crisp, but they were still good over salad, just a bit chewier. 2. Pour well-dried chickpeas onto a rimmed baking sheet (I lined my with a silpat) and roast for 10 minutes. Shake the pan and roast another 8-10 minutes, until the chickpeas crisp up a bit. Keep an eye on them to avoid burning. You don’t want them to change color, just be a bit crispy to touch on the outside by still soft on the inside. 3. While the chickpeas are roasting, combine the olive oil and spices in a medium mixing bowl. Carefully transfer the roasted chickpeas to the bowl and toss in the mixture until well coated. 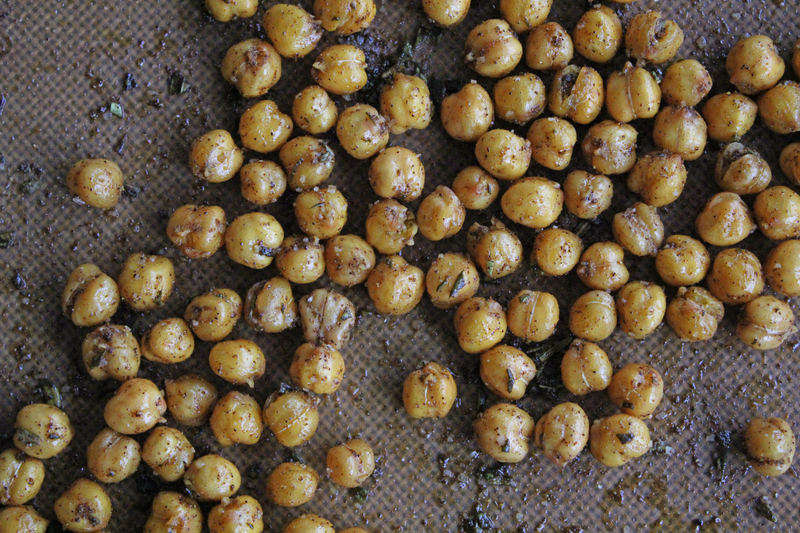 Return the coated chickpeas to the baking sheet and roast an additional 3-5 minutes, until fragrant. Let cool 1-2 minutes and serve warm.